Brian Jungen is regarded as one of Canada’s most important contemporary artists. Solo exhibitions of his works have been shown at such institutions as the New Museum of Contemporary Art, New York, 2005, Witte de With, Rotterdam, 2007, and the Smithsonian National Museum of the American Indian, Washington DC, 2009, as well at dOCUMENTA 13 in Kassel. In his exhibition at the Bonner Kunstverein, which has been realized in cooperation with the Kunstverein Hannover, Jungen presents works from the past decade. Large drums made from parts of car bodies and covered with animal skin rest on ice boxes and tower upwards. In these pieces produced for the present exhibition and that bear the titles Moon, Companion or Mother Tongue, Brian Jungen (b. 1970 in Ford St. John, British Columbia, lives in Vancouver, Canada) uses freezers as a matter of course as pedestals. Although these objects are employed as exhibition furnishings in the Bonner Kunstverein, they still today belong to the living hunting tradition of Canada’s First Nation People. The artist causes various forms of culture to encounter each other here, allowing these mass-produced articles from Western civilization to be seen in a new light. 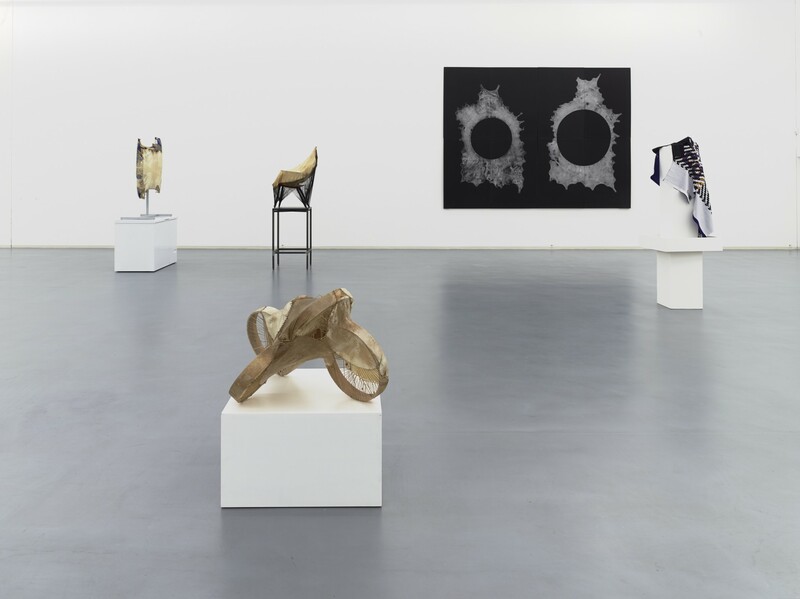 As the title of one of his early monumental sculptures, Shapeshifter, suggests, formal transformation of everyday objects is at the core of his work. A descendent of Native Americans, Jungen defamiliarizes Western culture’s consumer and entertainment goods and refashions them into seemingly archaic sculptures. He intertwines, sometimes literally, Western rituals involving sports with the handicraft traditions of Canada’s First Nation People by cutting up sports jerseys and weaving them into blankets. 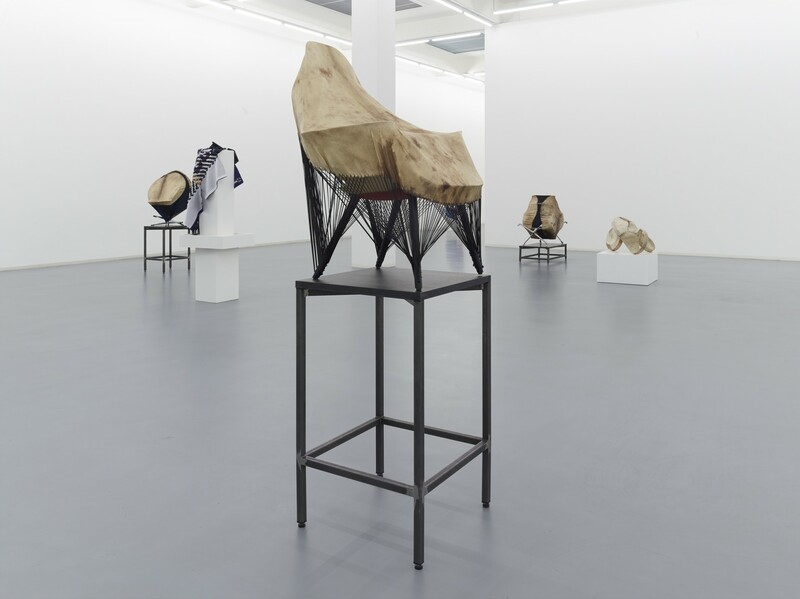 But in his dealings with tradition and modernism, Jungen is not content to just pose questions concerning the present-day identity of indigenous peoples but also uncovers globalization’s blind spot in his sculptural oeuvre. Jungen’s transformations of the everyday are also recognizable as a strategy of reappropriation in his works 1960, 1970 and 1980. 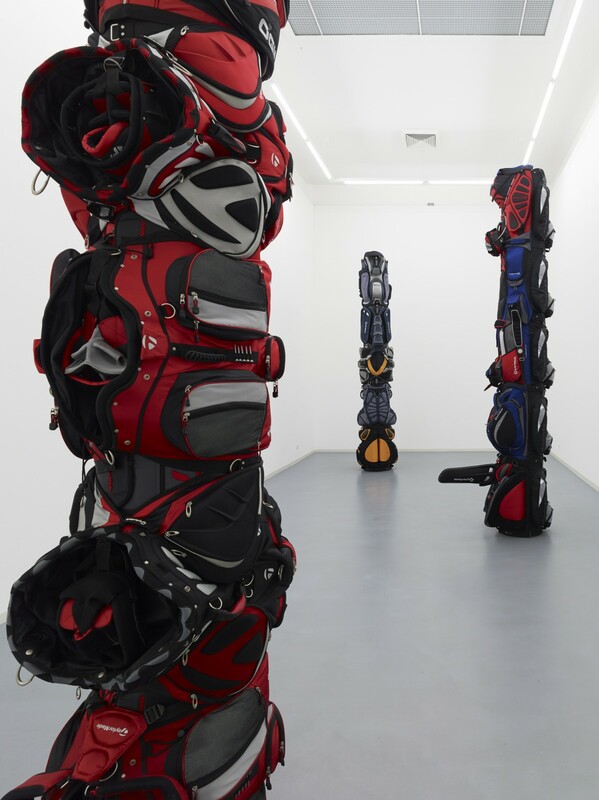 Stacks of golf bags have been assembled to form totem poles. They allude to the historic success of Canada’s Mohawk Indians, who were able to prevail against the threatened expropriation of their land to build a golf course. These three works point to the fight for their rights as well as to differing understandings of nature and culture. Jungen conveys the inadequacy of uniform cultural concepts through his preference for hybrid forms. The works on display in the show reveal the illusionary mechanisms of a living standard oriented on comfort and which finds expression in designer chairs, practical home appliances, fancy automobiles, high-tech sports gear and cushioned golf bags. The artist simultaneously alludes to images of the exotic in order to formulate far-reaching questions dealing with anthropological, economical as well as cultural borderlines. 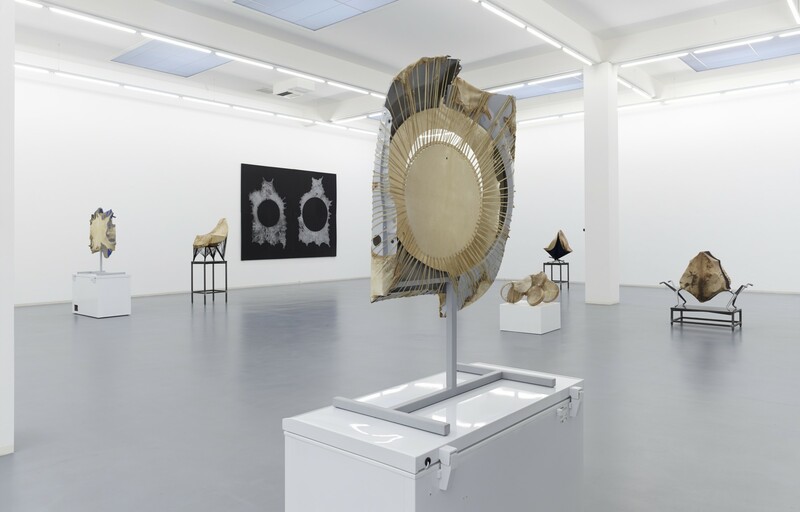 The political in Jungen’s work rest the sculpturally staged link between consumer good and objects recognizable as classic artifacts of indigenous culture. 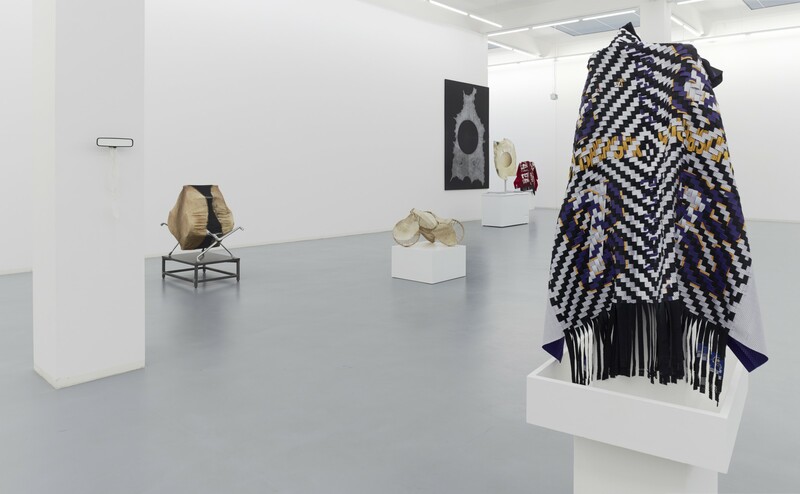 With reference to the aesthetic of diversity formulated by Edouard Glissant that defines itself via the diversity of relationships and not via ethnic descent, Jungen’s exhibition reflects new forms of reference to the Other in the context of a globalised culture. In this way he puts conventional notions of native and foreign, of the adapted, appropriated and imposed to the test. 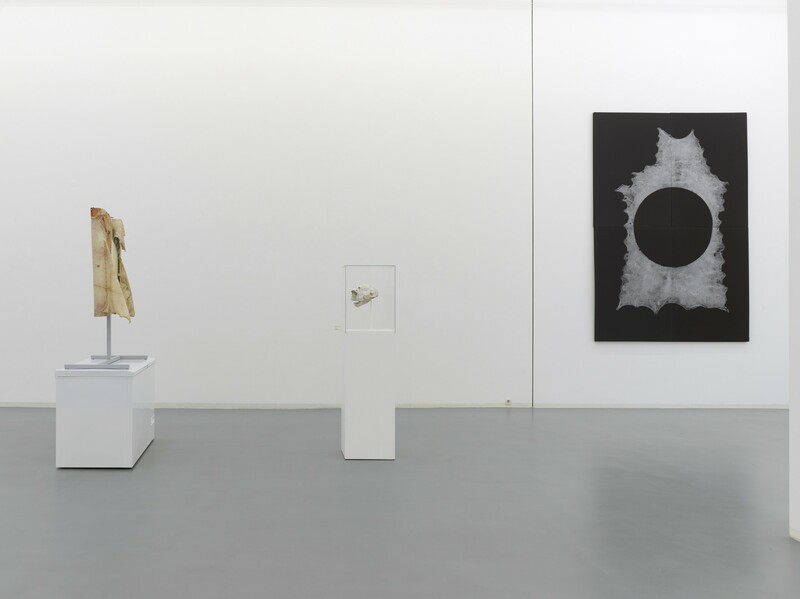 Der Bonner Kunstverein ist am 19. und 21. April aufgrund der Feiertage geschlossen. Samstag, den 20. 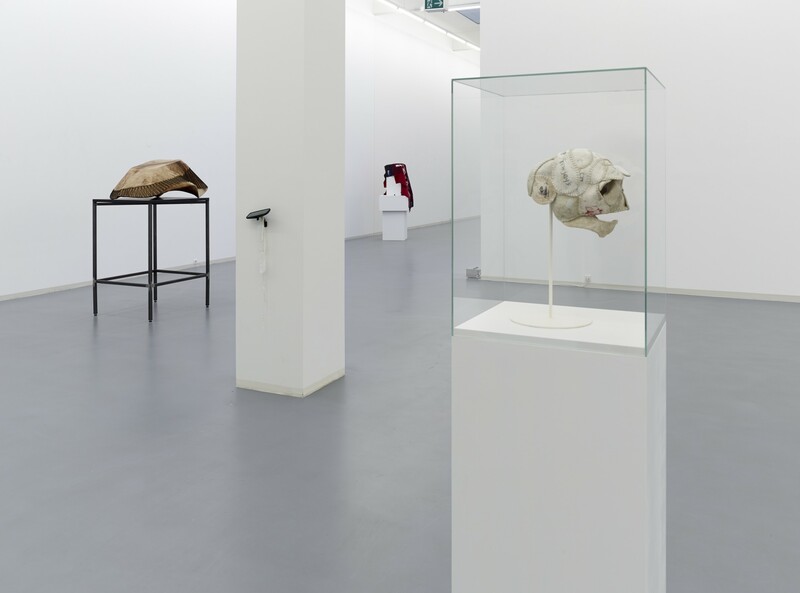 April ist die letzte Gelegenheit, die Ausstellung “Guan Xiao: Products Farming” zu sehen. The Bonner Kunstverein is closed on 19 and 21 April due to public holidays. 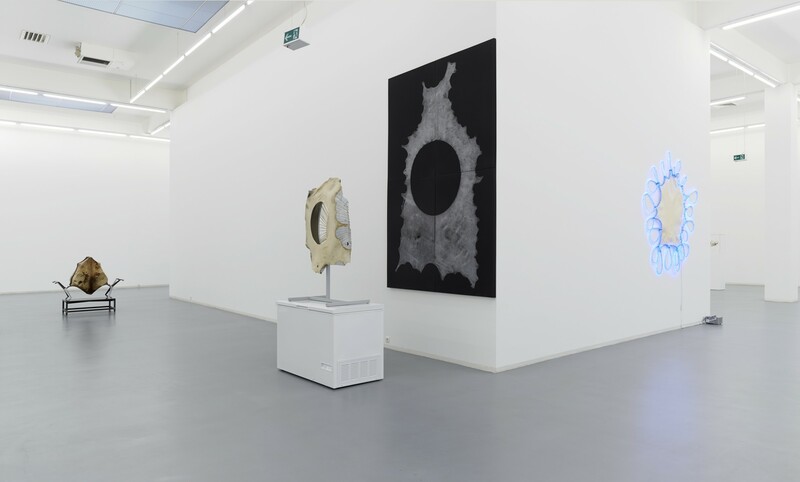 Saturday, 20 April is the last opportunity to see Guan Xiao’s exhibition ‘Products Farming’.